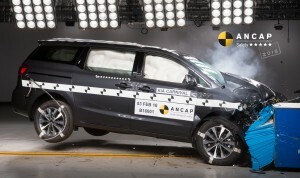 The Kia Carnival has achieved a 5 star ANCAP crash test rating after receiving improvements to its design from previous model. Also known as the Kia Sedona in other markets, the Australian version of the Kia Carnival people mover has now been issued with a 5-star crash test rating from the Australasian New Car Assessment Program (ANCAP) after it had received just 4 stars in its last crash test last year. In the intervening period, the model has undergone some safety upgrades which were designed to improve its offset frontal impact test performance. The new rating applies to all variants of the model manufactured from December 2015 onwards. The V6 petrol engined Kia Carnival manufactured before this date is rated as 4-star due to a disappointing performance in the frontal impact test in March last year. Having achieved just 10.48 points out of a possible 16 in that crash test, the updated version has increased its rating to 14.29 points. According to ANCAP, the risks to front seat occupants have now reduced significantly although the car still suffers from some issues relating to pedal movement and intrusion into the driver’s footwell area.